If your system is having problem connecting to the Internet, you’re advised to run Windows Network Diagnostics or Network Adapter troubleshooter. This automated troubleshooter is helpful in detecting network issues and is supposed to fix them as well. So in case if you’re also facing this problem on your Windows system, here is how you can fix it. 2. In Services snap-in window, scroll down and look for Diagnostic Policy Service. As you’re facing this issue, the service will not be running. So right click on it and select Start. 3. In few seconds, you’ll see that service is started and now have ‘Running‘ mentioned under its status. You can close Services snap-in then. This must resolve the network issue. If issue still persists, refer FIX 2 below. 1. 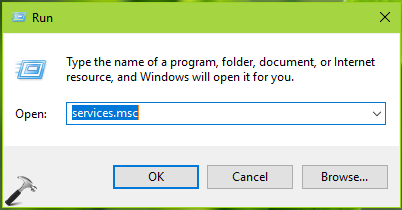 In Windows 10, right click on Start Button and select Command Prompt (Admin). On older Windows editions such as Windows 8.1/8/7, you can open Command Prompt as administrator, using Windows Search. 3. After each of these commands, you’ll get The command completed successfully message as a confirmation that it worked. So you can close Command Prompt and reboot to check the status of the issue. After restarting system, the issue will no longer exist.